Internet Banking : Something that You must Know ! Home» Finance » Internet Banking : Something that You must Know ! What Is Net Banking ? 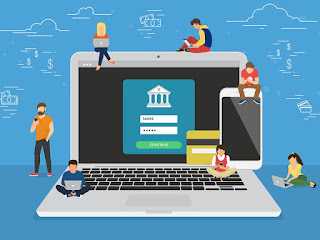 Net banking in the service which is provided to people in which people can get all the facilities on the mobile and computer and use them by sitting in home easily and frankly. net banking is also called online banking or internet banking. Using banking service with the help of Internet and mobile is called Internet Banking. With the help of internet banking you can check your balance of your account and not only that you can also do a transaction by your mobile or computer with the help of net banking. With the help of internet banking you can get lots of service and enjoy. With the help of internet banking what we can do some points are listed here. 1. You can check your account balance. 2. You can check your account activities summary ( Debit / Credit) etc. 3. You can do transaction with any other banks very easily with your mobile and computer with the help of internet. 4. You can set a date for transaction and when the day come your transaction will automatically be performed on that date. 5. Also you can do online bill payment for example electricity bill payment, water supply bill payment etc. 6. You can download your account statement in pdf file. 7. You can change your net banking login password and transaction password. 8. With the help of net banking also you can do online shopping. 9. Anyplace anywhere any website you can do online payment . If you want to purchase anything from any website then here you can use net banking. 10. With the help of net banking you can open fixed deposit account or ranking deposit account very easily. How To Start Net Banking ? * All the first you should have account in your bank, if you don't have you can create it very easily after that only you can use net banking. * Now go to your bank branch and update your email ID and your mobile number this is very necessary because all the activities done in your account will be email or phoned you. * After going in branch you should fill net banking form, after filling form you should submit a form after that you will get a net banking kit in which your user id and password will be .inform Bank you can directly contact to customer care and apply for net banking like PNB in this in few days you get net banking kit on your branch you can take it by going to your bank branch. * With the help of your user id and password given in the net banking kit you can easily get login login your banking website and apps and enjoy net banking service. 1. Regularly change your account user id and password. 2. Do not share your account detail, user id or password with anyone, bank never ask your detail buy calling you. 3. Do not login your user id and password in public computer like cyber etc this can be very harmful for your account. 4. Use antivirus in your computer. 5. I recommend you do not also save your user id and password in your own computer. HEY guys hope you like the information of net banking if you have any questions or any confusion or you want to give any suggestion then you can comment down. Thank You ! !